An unknown hacker has so far stolen more than $471,000 worth of Ethereum—one of the most popular and increasingly valuable cryptocurrencies—in yet another Ethereum hack that hit the popular cryptocurrency investment platform, Enigma. 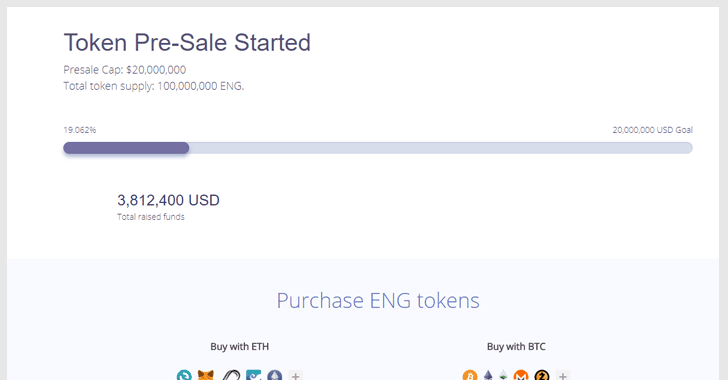 According to an announcement made on their official website an hour ago, an "unknown entity" has managed to hack their website, slack account and email newsletter accounts, and uploaded a fake pre-sale page with a fake ETH address to send money. 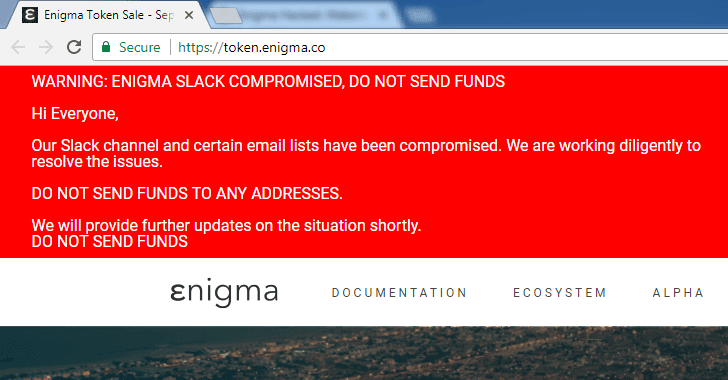 The hackers also spammed their fake address in Enigma's newsletter and slack accounts for pre-sale coins, tricking victims to send their cryptocurrencies to hacker's address. 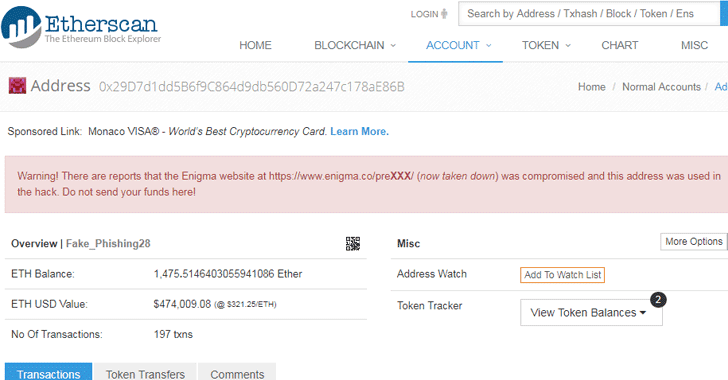 Etherscan, a popular search engine for the Ethereum Blockchain that allows users to look up, confirm and validate transactions easily, has already flagged the address as compromised, but people are still sending ETH to the fake address (given below). At the time of writing, the hackers have made over 1,487.90 Ether and are still receiving payments. 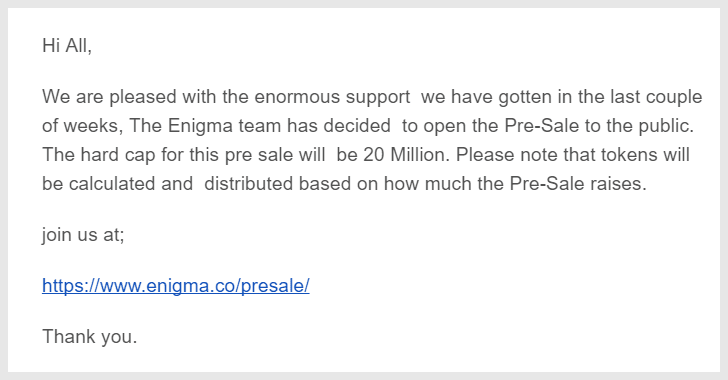 The hack comes a few days after Enigma posted an article, educating users on how to avoid phishers, scammers, spammers, and stay safe during a token sale. "As we work hard to build the future of data and crypto trading and investing, we want to take a few moments to talk about safety," Enigma Project wrote in the blog post. "Due to our strong growth, our community has become a target. The worst elements of the crypto scene—scammers and phishers—are attracted to good projects and good communities." $8.4 Million worth of Ethereum during Veritaseum's Initial Coin Offering (ICO). $32 Million worth of Ethereum from Parity's Ethereum Wallet accounts. $7 Million worth of Ether during the hack of Israeli startup CoinDash's ICO. $1 Million worth of Ether and Bitcoins heist in cryptocurrency exchange Bithumb. At the moment, it is unclear how the attackers broke into the Enigmas network and hacked their website, slack account and email newsletter accounts. Since cryptocurrency enthusiasts and investors are still sending their Ethereum to the fake address, you should share this story to warn your friends and followers.